Women with tattoos: it’s been a thing for a while, especially among Millennial women. But the history extends far back in California. A new exhibition at History San Jose explores a diverse and surprising relationship between women and ink in the Golden State. Curator Amy Cohen, who has tats herself, enjoys upending expectations. "That’s what I hear from a lot of people," Cohen says. "They had no idea that tattooed women have such a long history in California." Tattooed & Tenacious: Inked Women in California History features four chapters of that history, starting with Native American women, many of whom applied tattoos on each other as a rite of passage. "Women in a lot of tribes in California really held that tradition," says Cohen. "They were the ones who had the knowledge." 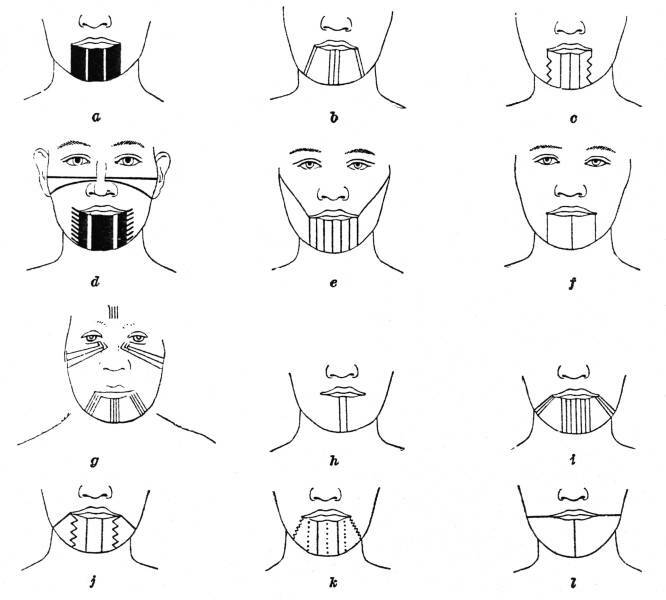 Native women also got tattooed for aesthetic purposes, just as women do today. Tattoos took off in caucasian culture among upper class Victorian women, who wore them underneath their high collars and tightly-laced corsets. "Wealthy women took a cue from their European counterparts," says Cohen. "They had portraits of lovers, nature imagery, family crests. Later, cars. And these were big tattoos, too. Just with the fashion of the day, you would never see it, unless they wanted you to." Circus freaks, or tattooed ladies, got covered neck to ankle. They mainly did it to draw crowds and make money. And they got to choose the art. One tattooed lady was Artoria Gibbons, a lifelong Episcopalian. "A lot of her tattoos have a religious bent," Cohen says. 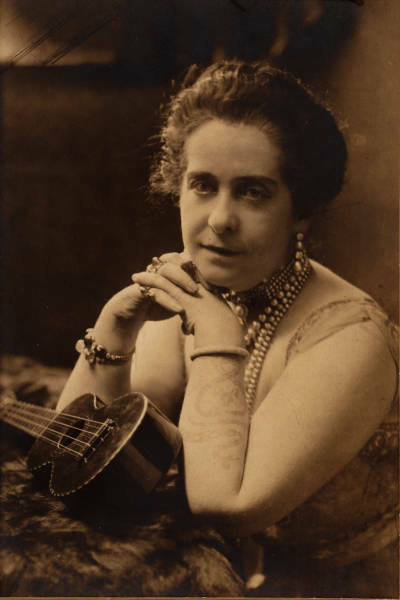 Another circus performer, Lady Viola, worked for Ringling Brothers and Barnum & Bailey with the branded slogan "The Most Beautiful Tattooed Lady in the World." She was really patriotic. "She has six presidents tattooed on her chest" says Cohen. "She has the US Capitol building on her back." Cohen put together the exhibition for her master’s thesis. The Hayward Area Historical Society, where she interned, was first to host the show. When History San Jose brought it in, curators added contemporary “flash art” from South Bay women tattooing today. There's a regional style to the art, according to Sam Rusk of El Toro Body Shop in Morgan Hill. The tattoo artist says a lot of the art in California follows obvious themes like the shape of the state, the Golden Gate Bridge, grizzly bears, and poppies, as well as quail, the state bird. People on the west coast also tend to look across the Pacific for inspiration, so you see a lot of Japanese, Chinese and Polynesian designs. "Big sleeves of koi fish." Rusk says. "Island and tribal stuff is pretty popular." Local gang culture pops up, too. "There’s heavy street influence," says Jaz Fuller, who works at Unlimited Ink Tattoo and The Iron Sparrow Parlor in San Jose. "I was out in Arizona for a while," Fuller says. "You’d get a switch blade out in the Bay, and out in Arizona you’d get an old school western revolver." Sarah Grossman, another local artist featured in Tattooed & Tenacious, and also in this groovy video on KQED Arts, works at Polished Tattooing in San Jose. Grossman is the only woman working at her shop. That's a common story. Not that the tattoo artist is uncomfortable about it. Grossman says tattoo art has always been a male dominated business, in terms of both the artists and the clients. But Grossman says that’s changing. 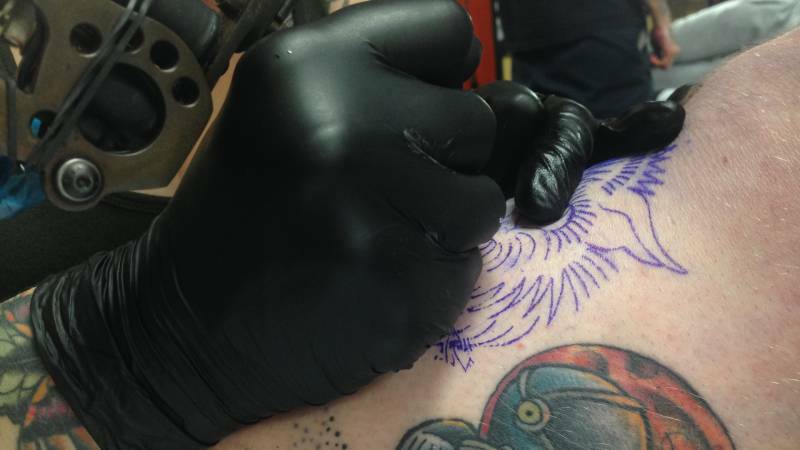 "It’s not that less men are getting tattooed," Grossman explains as she works on customer, for whom she's creating a fierce wolf with glaring yellow eyes and blood dripping from its fangs. "It’s that more women are finally getting tattooed because it’s such a decorative, popular thing. It’s kind of the new way to accessorize and to self-express." “Tattooed & Tenacious” continues through the end of the year. After that, it heads to Cal State Fullerton's Department of Anthropology Teaching Museum in 2017, and Mt. Shasta Sisson Museum in 2018.